I enjoyed Rick Riordan’s Percy Jackson series when I read it several years ago, and I always meant to go on to his next Greek (and Roman) mythology series…but those books were coming out just as I was desperately trying to get my unfinished series list down, and I had a terror of starting any new series! 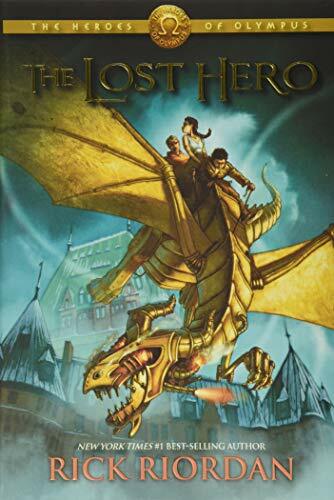 But that list has been under control for a while–and mythology is one of the categories for Once Upon a Time–and so it finally seemed like time to pick up the first book in the series, The Lost Hero. The book opens right in the middle of mysteries, when Jason finds himself sitting on a bus with no memories of his past or who he is. It could be worse, since at least he’s holding hands with Piper, a pretty girl who thinks they’re dating–and they’re also sitting with Leo, a wise guy who thinks Jason is his best friend. But it could be better, considering they’re attacked by wind spirits within the hour. By the time the winds settle, Jason, Piper and Leo are collected by a group of teenagers who take them to Camp Half-Blood–the sanctuary and training ground for demigods, half-mortal children of the Greek gods. Their leader, Percy Jackson, has gone missing, and the gods have stopped communicating with humans. A prophecy points to Jason to lead a quest to rescue the queen of the gods and defeat an ancient enemy who is on the rise. I so enjoyed returning to Riordan’s mythological landscape. The main characters are new, but the tone and style (even the nature of the plot arc, centered around a quest and a shadowy enemy) are familiar–and some characters from the last series show up in small roles too. This felt like it had an older target audience than the Percy Jackson books–not by a lot, but Percy got older in each book, and this series starts with a 16-year-old hero (so it’s like picking up where the Percy books left off). Jason is an appealing hero. He doesn’t know anything about his past, and he worries that he doesn’t know who he really is–yet he feels very grounded as a person. He’s always striving to do what’s right, to protect others and to take responsibility as it’s needed. You can tell he was a heroic leader in his past, even if he can’t remember it now. I like Piper a lot too. She has many troubles and disappointments in her past, and that’s turned into a lack of self-confidence hidden behind a tough exterior. Don’t get me wrong, she really is tough–but I also liked watching her grow, and become both more confident in who she is and more able to deal with her vulnerabilities. Leo, too, has some of that inner vulnerability hiding behind outer toughness–or, in his case, jokes and wisecracks. I have a soft spot for the funny guy supporting characters, and it’s even better when the funny guy turns out to have depth too. Also, in among the warriors, it was fun to have a character who defeats monsters by building clever machines. The battles and the dangers come pretty fast and furious here, and Riordan has a gift for interesting battles. It’s almost never just sword-fighting. There are weird monsters with weirder abilities, and the kids often come up with very creative and unconventional ways to fight back. All of that is balanced with really nice reveals on the characters’ back stories, and on their growth as individuals and as a team. If I have one complaint about this book, it’s that it seemed to try too hard to convince me the threat was very serious. I mean, I’m a writer, I get it–the last series had Percy and friends fighting Kronos and the Titans and it was BIG and EPIC and every book ESCALATED THE DANGER…so then how do you start your next series when you defeated the ultimate villain in the last one? Well…personally, I think I would have been cool with a smaller threat. I mean, new characters, new mysteries, it’s okay if the stakes are lower (at least in the first book). Instead, Riordan tells us (several times) that this new enemy is very, very bad–even worse than Kronos! And okay. That’s cool. But I felt a little hit over the head with the idea.